Photo courtesy of the "Chicago Reader"
The Chicago Reader has turned its eye to the the Fulton Market neighborhood and its new B_Line murals, the B-Line as in "making a beeline for" is a reincarnation of the 1970s Hubbard Street murals, reports the Reader. “A gallery and a museum of street art,” the chief curator Levar Hoard told the Reader. Hoard hopes to preserve the history of Fulton Market while restoring and expanding the murals on Hubbard Street. 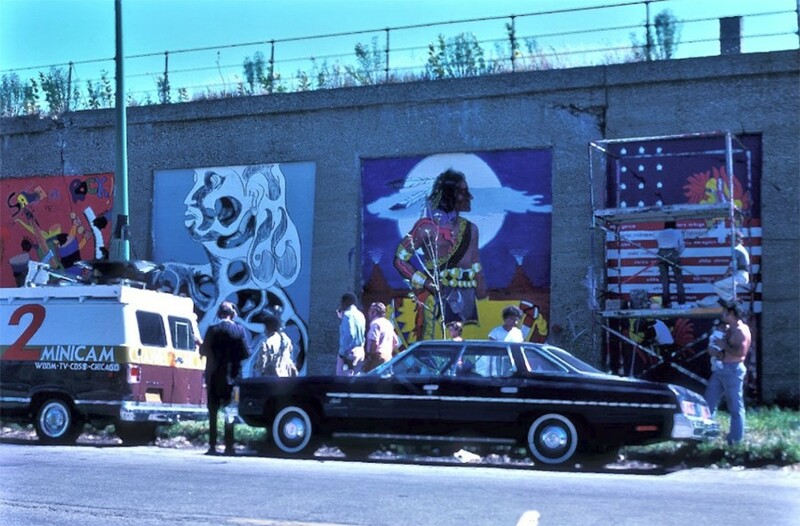 The project began in 1971 under Ricardo Alonzo, the founder of the Hubbard Street Murals, who says “Chicago was having a rebirth of social issues that had taken to the streets in the form of public art,” reports the Reader. Seventy-five artists from around the world have contributed to the newest set of murals, including two SAIC community members, alum Saul Palos Rodriguez (BFA 2018) and current student Kalan Strauss (BFA 2020) with the goal of bringing the B_Line's diversity and unity to the heart of the city.